Meerut-250 005, (U.P). Ph: 0121-2439043 / 52 ; 3058031 / 32. Associate Professor - Forensic Medicine & Anaesthesia. Assistant Professor - Forensic Medicine, Medicine & Anaesthesia. Senior Residents - Medicine, Pulmonary Medicine, Dermatology, Psychiatry, ENT, Obstetrics & Gynaecology, Pediatrics & Anaesthesia. Junior Residents - in clinical subjects. 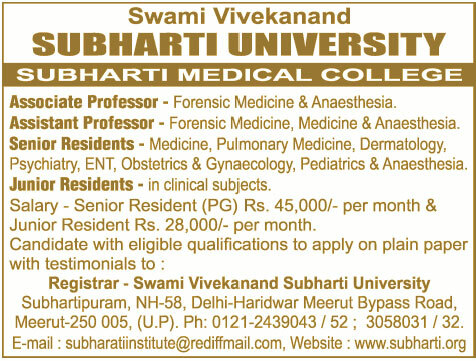 Salary - Senior Resident (PG) Rs. 45,000/- per month Junior Resident Rs. 28,000/- per month.